This section provides a comprehensive description of the custom elements that make up the XSL-FO extension for Office Open XML. These elements must be in a separate namespace specified by XMLmind. This namespace - referred to by prefix sdt in this document - must be declared in the opening tag of the root element of the XSL-FO tree, as shown below. These are inline-level elements that may appear anywhere inline-level Formatting Objects are allowed. The attributes described below apply to all form fields, except for the initial-value and prompt attributes that do not apply to the sdt:picture element. This attribute establishes the mapping between a field and an XML element in the Custom XML Data part. In the simplest case the value of this attribute is an XML element name. The Custom XML Data part will be automatically generated by XFC, in the form of a simple XML instance where all elements associated with form fields are children of the root element. When a Custom XML Data template is specified the attribute value is an XPath 1.0 expression that identifies the XML element associated with the field. If this attribute is omitted no mapping is established. This attribute specifies whether or not the field content is editable. Possible values are true (default) and false. This attribute specifies the field title. This title is displayed as part of the field outline when the field is selected. The default value is specific to each field type. This element is converted to a plain text SDT, which provides the functionality of a basic text field. This attribute specifies whether or not line breaks are allowed in the field value. Possible values are true and false (default). See generic attributes. (The default value is Text Field). This element is converted to a drop-down list SDT, which provides the ability to select a single value from a predefined list. See generic attributes. (The default value is Drop-Down List). This element specifies an entry in the list of possible values of a drop-down list or combo box SDT. This element is converted to a combo box SDT, which combines a text field and a drop-down list. See generic attributes. (The default value is Combo Box). 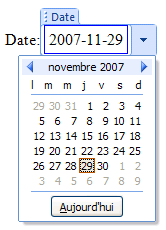 This element is converted to a date SDT, which is a text field with date semantics. This SDT provides a date picker for fast and secure input, though a date value may be typed in as well. The default value is %Y-%M-%D. See generic attributes. (The default value is Date). This element is converted to a picture SDT, which provides the ability to select, display and edit images. The value of this field - stored as the content of the associated XML element in the Custom XML Data part - is the Base64-encoded image data. See generic attributes. (The default value is Picture). This element specifies the initial value of an sdt:picture element. It contains the Base64-encoded image data to be initially displayed in the picture SDT. If this element is omitted an image placeholder will be displayed. This placeholder includes a button to open an image selection dialog. This element specifies optional parameters related to the Custom XML Data part. If this element is present in the XSL-FO tree it must occur before the first fo:page-sequence object. This attribute specifies the URL of an XML template to be used as the initial content of the Custom XML Data part. This XML template must be encoded in UTF-8 or UTF-16. The URL is resolved by XFC using its current URI resolver. As this template contains a namespace declaration, names in XPath expressions that identify an element in the template should be qualified. For this purpose one would set the prefix-mappings attribute and use the so declared namespace prefix to qualify element names in XPath expressions, as shown below.